Reviewing an album by a band that belongs to one's absolute personal favorites is always a difficult task. By heart, you want it to be yet another one of those masterpieces that got you hooked on the band in the first place, which make you see greatness where there is only mediocracy. On the other hand, you have a firm expectation of the sound of the album, which make you narrow-minded towards the slightest of changes. When it comes to yours truly and Morbid Angel, expectations were sky high regarding a certain 2011 full-length (as I see this album as the Harry Potter lore sees Voldemort it will henceforth be named 'You know which'.) In short, it turned out to be a turd of experiments gone wrong. Only the extremely broadminded could possibly find enjoyment in an album like 'You know which'. Even the songs still rooted in the bands classical style were painfully uninspiring, no matter how much heart one put into it. As we spell 2017, and the sequel to 'You know which' is about to make its mark on the world, feelings are as mixed as they come. The painful rampage of 'You know which' still fresh in mind, the desire is stronger than ever for a return to the ways of old. Still, one barely dares to raise any hope. The first few spins of 'Kingdoms Disdained' proved two important points: Morbid Angel has returned fully to the death metal which made them a household name and all the loathsome influences of 'You know which' is gone. This one pretty much follows right where 'Heretic' left us and is Steve Tucker-era Morbid Angel to a tee. 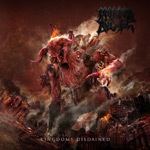 Structurally straightforward, yet instrumentally technical, 'Kingdoms Disdained' carries the heavy Morbid Angel legacy. New drummer Scott Fuller is tight and Steve Tucker vocals sounds as vigorous as in 1998. If anything is slightly "new" on this one it is a certain groove in some songs (e.g. 'Architect and Iconoclast') which could be traced to 'You know which'. But apart from this, 'Kingdoms Disdained' will satisfy the expectations of the old narrow-minded guard such as yours truly.
' and might grow even further. With 'Kingdoms Disdained' Morbid Angel shows a return to the form I honestly feared would be lost forever. With a heads on death metal sound and songwriting worthy of the first Tucker-era, this one brings hope to the ancient ones.